I've owned quite a few Guilds (both 6 and 12 string) that have had cracks between the neck and the soundhole. I've always blamed pickguard shrinkage for those on the treble side (may or may not be correct) but could never dream up a reason/excuse for those on the bass side. Anybody have any insight into what might cause that??? Also, I haven't seen it on Gibson or Martin guitars I've owned but admittedly I've owned far more Guild than any other manufacturer. Any thoughts/ideas/facts????? 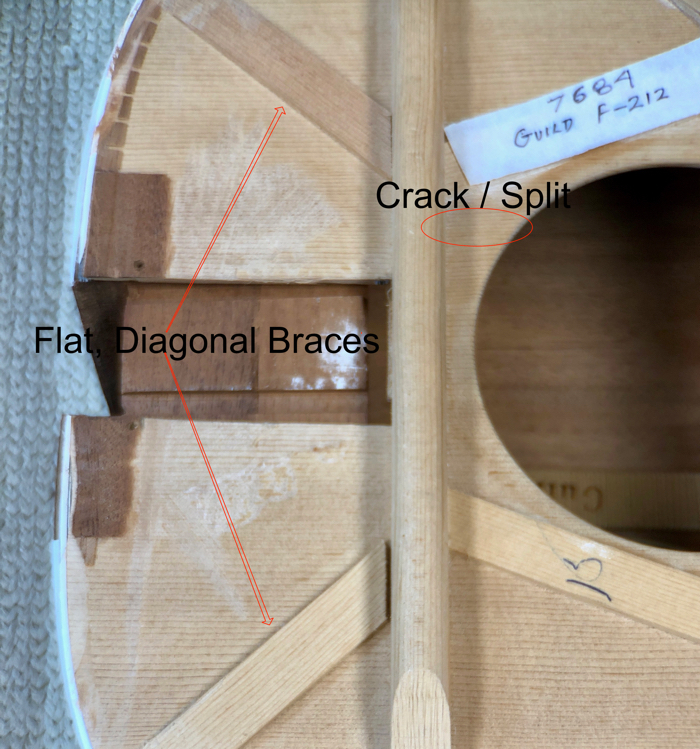 If the crack is on both sides of the neck extending to the sound hole, and that section of the top has also moved toward the bridge, then that is probably a shifted neck block. Often caused by leaving a hide-glue assembled guitar in a hot car. Here's a particularly bad example from Frets.com. Last edited by gjmalcyon; 01-16-2019 at 09:42 PM. I have five Guild Flattops, one for over 50 years, two for over 40, plus have had a few others over the years. Never had this problem. I had a few Guild acoustics for many years and I never had a crack in the wood but did get finish cracks between the pickguard and neck on a '80 D40CE. As gjmalcyon suggests, suspect you've been seeing the effects of the neck block shifting forward as the neck is pulled towards eth bridge by string tension. 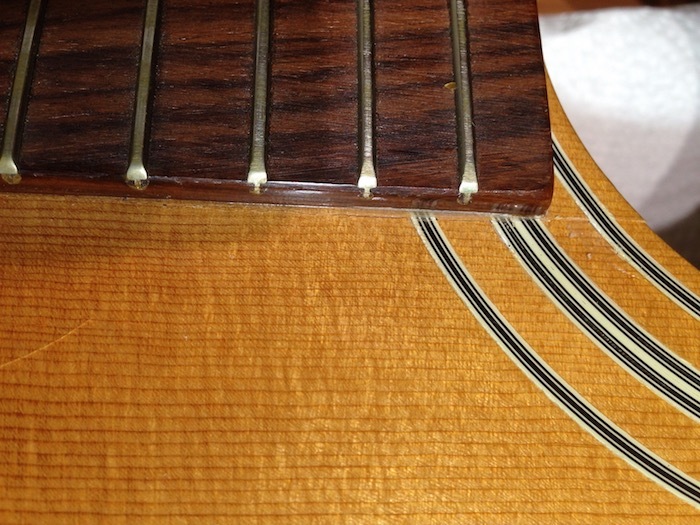 "I have no idea when it occurred, but the dreaded neck block shift had struck this guitar at some point in recent history, splitting the top along one edge of the fingerboard extension from the neck block to the edge of the soundhole. It wasn't grotesque, but it was noticeable, and it identified a larger underlying problem. A neck block should never shift." " These guitars were constructed without using a fingerboard patch, a thin horizontal strip applied to the backside of the soundboard just behind the transverse brace and extending across the width of the upper bout. Instead, a small block was added at 90° to the neck block, sized to be the width of the fingerboard extension and glued to the underside of the soundboard. While this extra buttressing would counteract the tendency of the fingerboard extension to depress the soundboard, should the neck block ever shift forward it would take that section of the soundboard along with it. Last edited by adorshki; 01-16-2019 at 10:02 PM. As has been said above, failure of the neck block to support the intense pull of the strings towards the bridge. When it fails then everything starts to shift towards the bridge causing those types of cracks. It's quite a difficult thing to correct, and more expensive than just normal soundboard cracks. Again, as mentioned above, this is from the guitar being subjected to extreme heat or sunlight and the glues holding the neck block let go, and then the collapse begins. I'll go along with the neck block theory. But regarding neck block glue failure, it's interesting that some luthiers avoid Guild neck resets because (they say) the glue is too good. Funny you should mention that, I was just reviewing Mr. Cozad's article on re-setting the neck of an F412 and he addresses that issue very specifically, too. In past we've seen a number of contributing factors mentioned that support that perception, even though they're most likely the exceptions rather than the rule. "Something of an urban legend has developed over the decades regarding a notion that Guild dovetailed guitar necks are somehow generally more difficult to remove than other manufacturer’s dovetailed necks. This has simply not been my experience with these guitars, now spanning more than 4 decades...."
"When properly softened, it is just not that big of a deal to remove the neck. 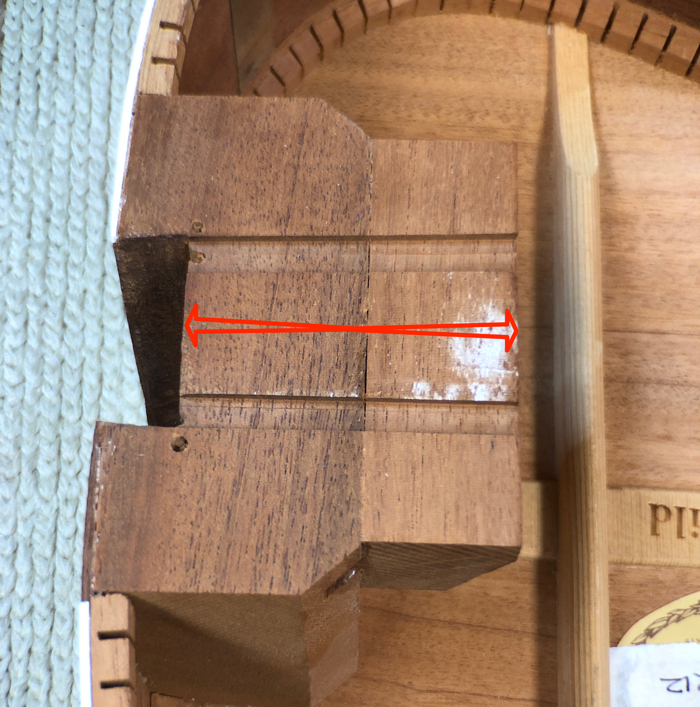 Short of general inexperience, I believe the primary reason for difficulty encountered during dovetail neck removal on Guild guitars may have more to do with improper placement of the steam hole(s) and/or insufficient application of steam/heat than the amount (or even type) of glue used." Just don't confuse yourselves, guys. There are two different things being talked about above. The neck block is set into the guitar's body whereas the neck itself is joined to the neck block later in the assembly process. That neck block shifting slightly over time (due to levered tension on it by the neck) is what's being blamed for the kind of damage shown above that Richard was asking about. My F-212 (which Al referred to, above), had suffered a crack / split in the soundboard along the "bass" side of the fingerboard extension. The treble side remained intact. Curiosity got the better of me and I had (eventually) removed the soundboard to have a look inside. The split was barely visible along the inside of the soundboard, but was glaringly obvious on the face of the soundboard, running all the way from the binding into the sound hole. All the glue joints were intact. While there is a remote possibility that this instrument suffered some kind of sudden heat stroke that went unnoticed by me (where the glue softened enough for wood to "let go"), I believe the crack is the result of either impact damage (such as a sudden blow to one side that torqued the neck, perhaps while in the case - have you ever witnessed baggage handlers with guitar cases?) or maybe due to the neck block swelling from humidity and taking that portion of the soundboard with it.